Anderson's Maple Syrup will once again be sponsoring 4-time NASCAR Camping World Truck Series (NCWTS) champion and NTS Motorsports driver Ron Hornaday in 2013. Anderson's will serve as the primary sponsor on the No. 9 Chevrolet Silverado for four races with Ron - Dover Motor Speedway (May), Kentucky Speedway (June), Iowa Speedway (September), and Chicagoland Speedway (September). 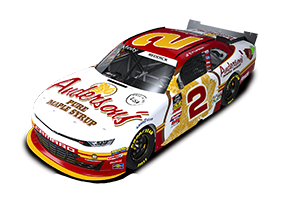 "I have had the privilege of carrying the Anderson's Pure Maple Syrup colors for a couple years now," said Ron Hornaday, "they are a small, family company with big dreams and a great product. They have been loyal supporters of mine and we look forward to building their presence in market and on the race track in 2013." Click here to view the NTS Motorsports Media Fact Sheet. Click here to view the background information on NTS Motorsports. Click here for a video about Ron Hornaday's famous sofa. Click here to view the Chicago Press Release. Click here to view the Iowa Press Release. Click here to view the Iowa Post Race Report. Click here to view the Eldora Press Release. Click here to view the Kentucky Press Release. Click here to see a video of one of Ron's pit stops. Click here to view the Kentucky Post Race Report. Click here to see a video of the ACME shopping spree. Click here to view the Dover Press Release. Click here to view the Dover Post Race Report.